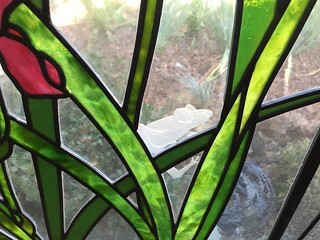 Lighting a big stained glass panel is tricky. 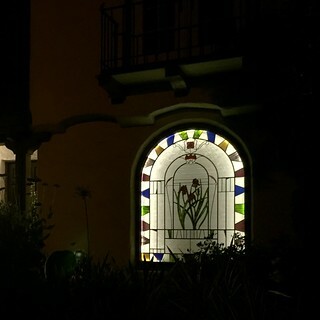 You want the light to be warm and even across the surface to show off the colors and and patterns. Museums like The Richard H. Driehaus Gallery of Stained Glass at Chicago’s Navy Pier feature custom light boxes to present their masterpieces. 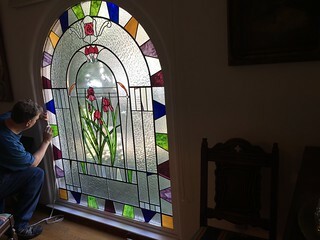 Those of us with stained glass built into our homes as windows need another solution that addresses inside/outside light and darkness. 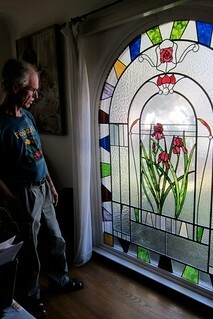 The glass should look good from both inside and out: a gift to the street. 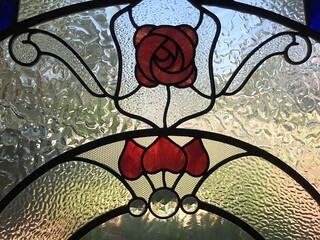 Our architectural stained glass was created by Vince Taylor, starting in 2004 with a big panel in the dining room plus a smaller panel in our front door. 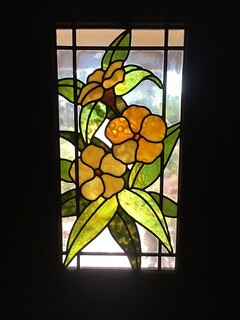 In addition to being lovely, the panels provide privacy from the street and help reduce the heat and glare from direct sunlight on the hottest side of the house. 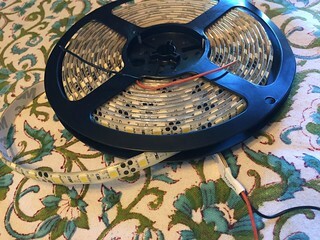 John tried lighting the big panel in a variety of unsatisfactory ways until he settled on LED strips around the edge. 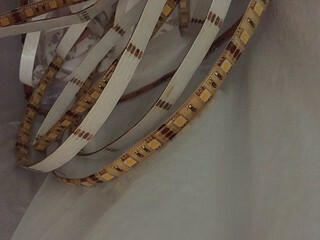 These work the best of the options we have tried – providing a warm and inexpensive light source – but the strips become brittle in sunlight in about five years. Today, John replaced the set.